The main purpose of Schiff MegaRed Joint Care is to provide comfort for your joints and help them become healthier. Based on krill extract and a proprietary blend that combines the benefits of omega-3 fatty acids with antioxidants and hyaluronic acid, Schiff MegaRed Joint Care promises to cushion your joints with newly produced and improved fluid, so that you experience fewer pains and move around more freely. Even a clinical test is mentioned, in regards to this product’s efficiency in aiding people with achy joints. We want to look closer at this product to see how efficient it can be in treating your joints. What Does Schiff MegaRed Joint Care Contain? Krill oil is rich in omega-3 fatty acids, known to promote overall health, and also reduce the incidence of coronary heart problems. Hyaluronic acid is one of the main components in the synovial fluid that keeps your joints well cushioned and healthy, while astaxanthin is an antioxidant. 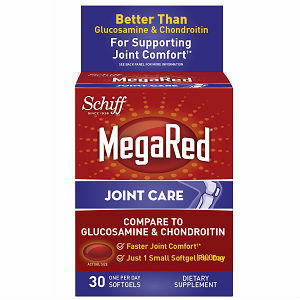 However, Schiff MegaRed Joint Care does not contain glucosamine sulfate and chondroitin, and even claims that its formula is better, mentioning a clinical study. It must be said, though, that no direct link to that study is provided. Also, there are quite plenty of extra ingredients added, with no role in protecting your joints or offering pain relief. The recommended dosage is one softgel capsule per day. One bottle contains 30 softgel capsules, enough for one month. It is priced at 37.99USD. The manufacturer offers 30 day money back guarantee policy, calculated from the date of your purchase. Schiff MegaRed Joint Care is based on the powerful ingredient hyaluronic acid, and it even claims to be supported by a clinical study that shows great improvement for patients with achy joints after seven days of taking the supplement. It also contains krill oil and astaxanthin, however, the absence of important ingredients, like glucosamine sulfate and chondrotin, is definitely a negative. However, that said, the price is pretty much on par with other similar supplements and consumers only need to take one day. They also offer a 30-day money back guarantee which is a always a positive sign, albeit, it could be increased to allow consumers a longer period of time to ascertain the success of this product or not. Click here to learn about our Top Joint Supplements. Mark Stevens	reviewed Schiff® MegaRed®	on June 3rd	 and gave it a rating of 2. Copyright © 2019 Joint Center- All Rights Reserved.